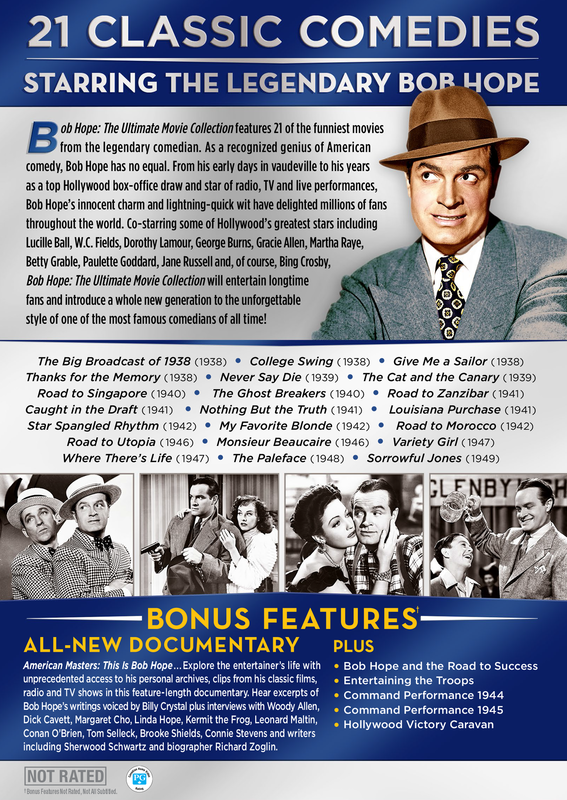 Bob Hope: The Ultimate Movie Collection features 21 of the funniest movies from the legendary comedian. As a recognized genius of American comedy, Bob Hope has no equal. From his early days in vaudeville to his years as a top Hollywood box-office draw and star of radio, TV and live performances, Bob Hope’s innocent charm and lightning-quick wit have delighted millions of fans throughout the world. Co-starring some of Hollywood’s greatest stars including Lucille Ball, W.C. Fields, Dorothy Lamour, George Burns, Gracie Allen, Martha Raye, Betty Grable, Paulette Goddard, Jane Russell and, of course, Bing Crosby, Bob Hope: The Ultimate Movie Collection will entertain longtime fans and introduce a whole new generation to the unforgettable style of one of the most famous comedians of all time!